​Click on an image to get dates, more info and register. 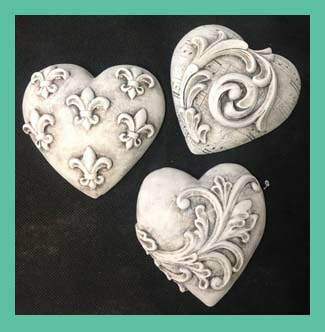 Paint a set of 3 decorative Hearts. From a range of over a dozen designs you get to choose 3 to make your set. Choose your favourite colour from our range of 27 Passion for DIY chalk paint colours to complete your set. 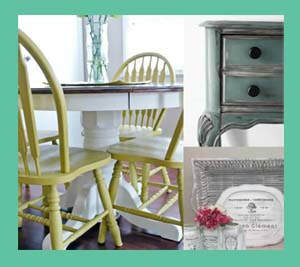 You will be guided through the painting process and how to apply a decorative finish to add character and charm. This is a 2 hour class that is relaxing, rewarding and fun. 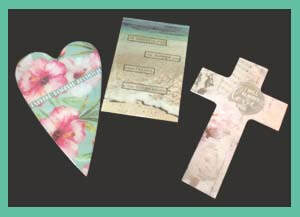 ​This is a super fun class where you will learn all about Decoupage. 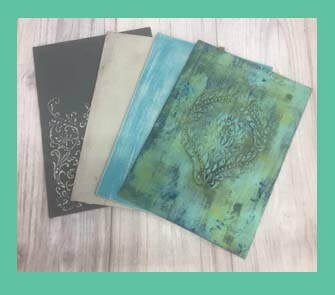 I will demonstrate several different techniques of cutting, ripping and separating different papers and paper napkins as well as the gluing and sealing process. 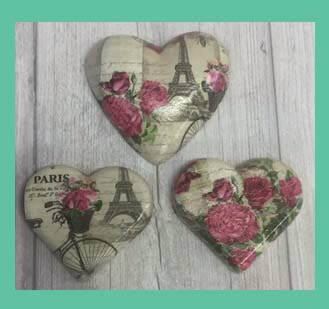 You will be given hints and tips on design ideas and other Decoupage processes which will help you tackle other projects that may interest you as well as ensure you achieve your desired beautifully finished set of hearts in the class. There is a huge range of designer napkins to choose from and in this workshop you will decoupage a 120mm puffy heart and 2 x 90mm flat hearts finished in a glossy sealer. 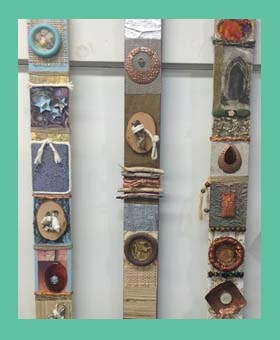 All materials are provided for this class but extra supplies will be available for purchase should you like to continue to do more decoupage at home. These Quirky tiles are made from designs cut from coloured resin and are just adorable. You can choose from our patterns or you can design your own. In this 2 hour workshop you will complete 2 tiles, one of which will be returned to you in a frame. 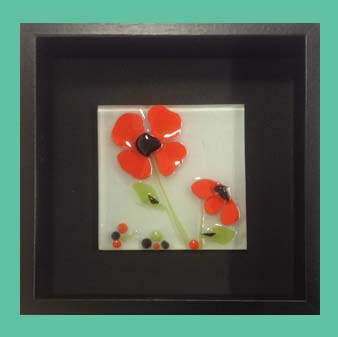 The resin takes several hours to set so you will not be able to take them away with you but we will arrange to get them to you when they are ready. ​The cost of this class is $45 all materials supplied, including one frame. Cutting out pieces for collage is relaxing and therapeutic and the finished result is so satisfying. Choose from several design images and papers to cut, arrange, paste and admire before adding a small quote or words of your choice. To top it off you will pour a layer of resin to cover your collage which will make it POP and give it a professional glass like finish. All of this is achieved in 2 hours but because of the drying time of resin you will not be able to take your masterpiece with you on the night but we will arrange getting it to you in a day or two when it is ready. Prepare to become addicted, with a few simple painting tips and some hands on guidance we will help you transform a piece of furniture or accessory like a pro. You will come away with a completed project, plus a new found confidence that will enable you to tackle any project you wish. ​All you need to bring is a small piece of furniture or accessory ready to be transformed. Suitable pieces could be, Chair, Lamp, small Coffee Table, Bedside Cabinet, Decor Accessory or any other small piece of furniture that you can carry in yourself. Keep in mind pieces need to be a reasonable size so they can be completed in the allocated workshop time. This workshop is one five hour session and the cost is $60 all materials and tools are included. ​PAINT FINISHES & PATINAS. I am really excited to be offering this workshop that will introduce you to the amazing finishes and effects that can be achieved with our passion for DIY chalk paint system. This is a hands on workshop over 2 days in which you will be guided to create at least 16 different effects and decorative finishes which will help you achieve professional and quality furniture and decor for your home that has character and heart. You will paint smooth finishes, several different textures & stone finishes, layered finishes, several distressing techniques, adding texture to your piece, enhancing detail and textures with wax and colour washes and dry brushing plus lots more. This is the perfect workshop for those just starting out on their furniture painting journey as well as those who are ready for the next step. The cost of all of these wonderful resources and this 2 day workshop is $95. This is a new and exciting course suitable for anyone looking to try a new medium and who loves to experiment. 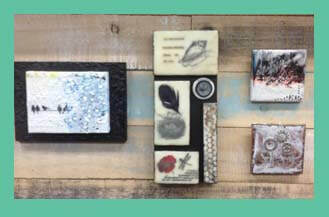 Collage and Encaustic in the same sentence, doesn't that just push your curiosity button. Telling a story with collage elements embedded and fused between layers of hot Encaustic Wax giving a sensual translucent effect ticks all the boxes of intrigue. Experimenting with this amazing age old medium on different backgrounds with different textures and printed images makes for hours of fun and excitement. This is a basic course over 5 evenings covering safety, tools, base preparation, getting to know the medium and at least 6 techniques to get you started with Encaustic Collage. Come along and get creative, design & create a wonderful piece of Art. Take your wooden post & create design elements to add to it to tell a story. That story could be themed by colour or texture and be a visual record of a time or event or just be a fantasy display. Designing and creating elements from scratch will get your creative juices flowing and hopefully kick start you into the realm of Mixed Media. You will be guided through techniques and finishes which will enable you to take your Art Stick flow in the direction you want. The cost of this workshop is $75.00 and is over 3 evenings. 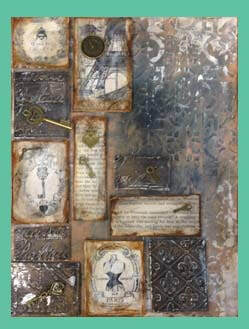 This is a fun introduction to Mixed Media Texture with the use of stencils, Passion for DIY Texture Icing, embossed metal tape and other found items. You will make a series of small blocks and design a layout to be presented on a textured background. You will add an aged Patina and a metallic highlight as a final touch. The cost of this 2 hour class is $40. All materials supplied. These three house shaped pieces are brought together by applying a chosen theme of images from our large selection. 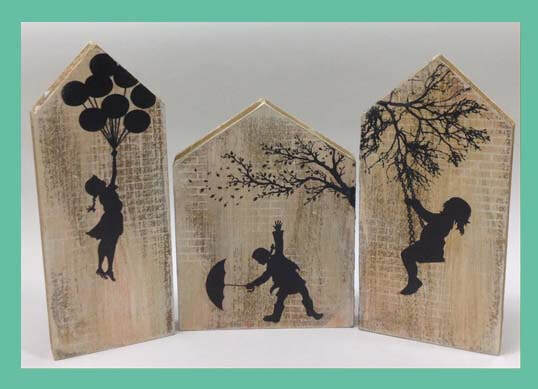 You will apply a background treatment with paint and stencils and aging solution then add your images with our transfer paper to bring this cute Triptych to life as your own set.